I hate to have to cancel a fishing trip due to weather. Worse, is trying to do it as far in advance as possible. 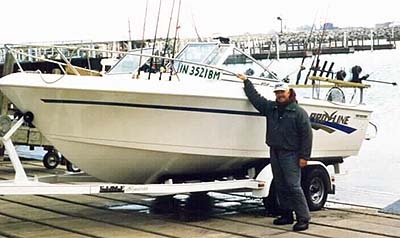 Some captains won't make "the call" until the morning of the trip at their dock. Fine, if everyone is local. 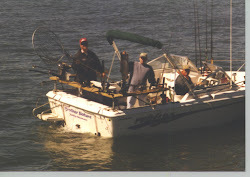 But I don't want someone driving an hour or two in the dark; or even worse, to drive up the night before our schedule day on the lake, rent a room or two to accommodate the group and then be told, “Sorry Charlie” at the boat docks. Sure, there are probably several days when the weather “guessers” get it wrong and the winds or rain or whatever trip-ender conditions are predicted don’t materialize and the trip is saved. I’m sure there are far more times when either the fishermen go home with wasted time and treasure. Sure there are times when I get surprised and do call a trip off at the dock or as soon as I see the lake conditions up close and personally - not often. Maybe once or twice per season; some seasons zero times. When I’m wrong, I’m bummed. My first sentence is worth repeating. I hate to have to cancel a fishing trip due to weather. However bummed, I’m at least relieved when I check the radar the morning of the trip or monitor the wind/wave buoys afloat in the lake and find the predictions I believed well enough to cancel a trip are proving the forecast correct. 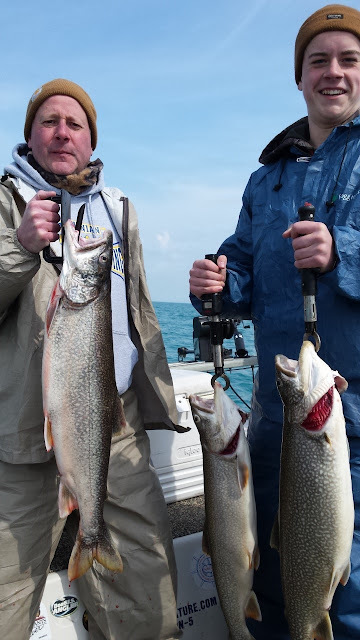 Why am I sitting here, blogging, instead of sitting in my boat helping a group of anglers experience the fun and excitement of Lake Michigan fishing? Look at the weather radar screen-cap pictured here at about the time our adventure would have started. As I told my customer last night when I was calling off the trip, “I don’t care if a person has a thousand dollar rain suit or a one dollar plastic poncho. By the time you’ve fished in a steady rain for a few hours, you’ll be wet and cold.z"
In the news the past couple days comes a report of a toxic chemical, hexavalent chromium, accidentally being spilled into one of the discharges at a steel processing plant along Burns Waterway, a.k.a. Burns Ditch. This is the river leading from Lake Michigan to the Portage Public Marina where I originate many of my Lake Michigan fishing trips. 1) The steel company, fixed the leak and stopped the outflow as soon as possible. The company self-reported to authorities including the EPA, Coast Guard, IDEM and DNR. 2) The Portage Marina and boat traffic on the waterway was closed for a short time but both are now open, as normal. 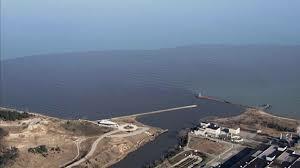 3) The aerial photos of the mouth of the waterway is misleading. 4) The EPA is the lead agency with other agencies helping where needed. 5) Drinking water intakes and nearby beaches are closed for precautionary reasons only and testing is on-going. 6) Hexavalent Chromium is bad stuff, made famous by the Erin Brokavich movie. The H.C. contamination in the movie was long-term exposure to people through drinking water contamination from long-term dumping by a power company. That doesn’t make this incident good. It does make the Portage incident different than the California incident. 1) No one knows how much H.C. was spilled. The broken pipe leaked contaminated water, not pure or concentrated H. Chromium, but how much went down the drain isn’t known. 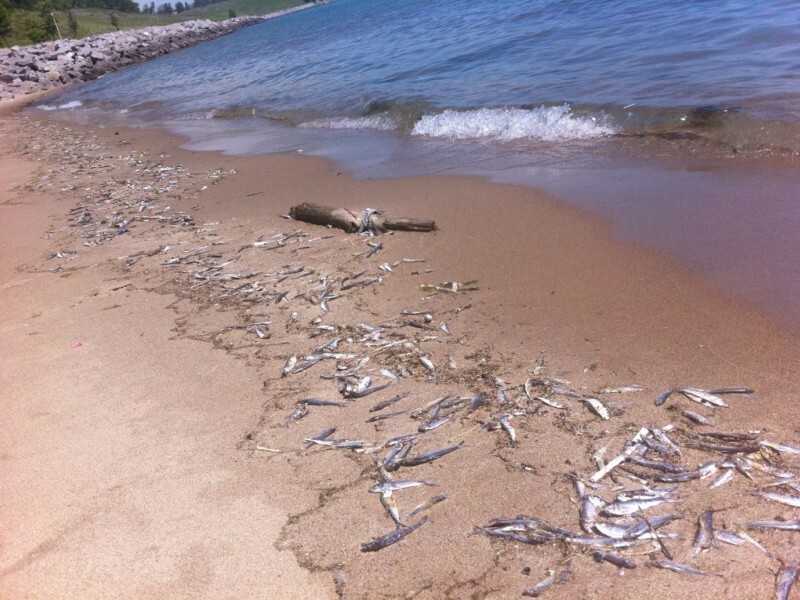 2) Official reports are none of the stuff made it to Lake Michigan. Is this true? If it were certain, no need for #5 Known Fact. Regardless of knowns and unknowns, let me say: THIS IS BAD. THE TOLERANCE FOR TOXINS ENTERING PUBLIC WATERS SHOULD BE ZERO. So far what I’ve seen is a mix of real news, conjecture and fake news. I’ve not heard many facts not filtered through three or four sources. FAKE NEWS - There have been substantial rains recently and there's a lot of silt in the water flowing down Burns Waterway from upstream. The ditch-water is brown, Lake Michigan is green/blue. Fly over in a copter or with a drone to take photos for your news show or newspaper and you see a big brown plume of water running out of the ditch into Lake Michigan. On screen or in the photo it looks like there's a bajillion gallons of water, chemically tainted dark brown, flowing out into the lake. The look of this photo would be identical whether the spill had occurred or not. 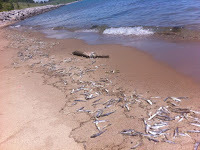 Similar photos can be taken at every tributary of Lake Michigan after storm run-off runs into the lake. My best guess is if there are any affects, they will be localized and short-lived. I would imagine we'll get the "rest" of the story in the next few days or weeks and it won't be as glamorous as the drone-photo of the muddy water flowing out of Burns Ditch so it will be a page two filler article. There are plenty of places to fish, completely unaffected. I don’t know when the concept of winter “outdoor shows” was invented. This year one of the country’s largest shows, the Indianapolis Boat, Sport and Travel Show marked it’s 63rd incarnation so my quick math put it’s origin in the middle 1950s. 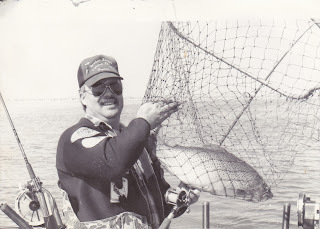 Regardless of where or when, to a young kid from the country, barely into his teens and infected with a yearning for all things outdoors, it was better than a trip to Disneyland. Aisle after aisle of places to hunt, fish and travel opened before me, each booth was manned by men who lived in the North Woods and who caught strange and exotic fish. 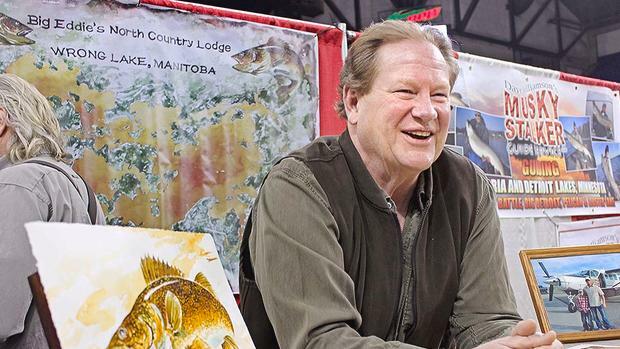 There were exhibits with mounted moose heads, northern pike as long as my leg, displays of tackle I didn’t know existed and could never afford. Naturally, this was pre-Internet, pre-Outdoor Channel on TV, pre-anything other than a few outdoor magazines for outdoor destinations to advertise their wares and facilities. Some entrepreneur invited a few resort and lodge owners to one location and eventually a circuit of outdoor expositions had developed. Outfitters, guides and lodge owners lived a carnival-like existence spending their winter on the road - far from their moose and strange fish. They’d spend a few days in Minneapolis, then off to Milwaukee, Chicago, Cincinnati, Louisville and on across the region. It was expensive, but as the ad salesmen say, advertising doesn’t cost, it pays. Soon after I started Brother Nature Fishing Adventures, I found myself on the other side. 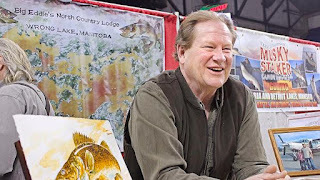 I built a display, purchased booth space and watched armies of outdoor enthusiasts, bored stiff with winter weather, walking the aisles, mostly looking, sometimes shopping, often stopping by just to talk for a while. Luckily, I didn’t have the time or money to run the circuit. Luckily, the Internet “happened” and I don’t have to run the circuit to drum up business. But I still attend a show or two each year. For old time’s sake, I suppose. Occasionally, I’ll make a sale. 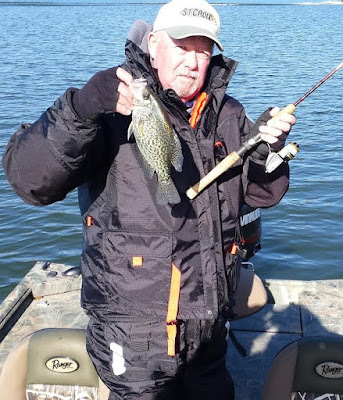 Mostly, they are an enjoyable, a winter diversion, a chance to meet new people, to meet up with old friends and talk fishing, hunting, old age pains or future plans. 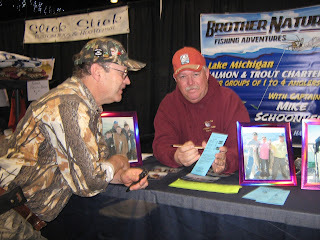 This weekend, March 11 and 12, I’ll be at the Hammond, Indiana Cabela’s Store for their Captain’s Weekend. Stop by my little display for a visit. We’ll talk fishing, hunting, old age pains or who know what. 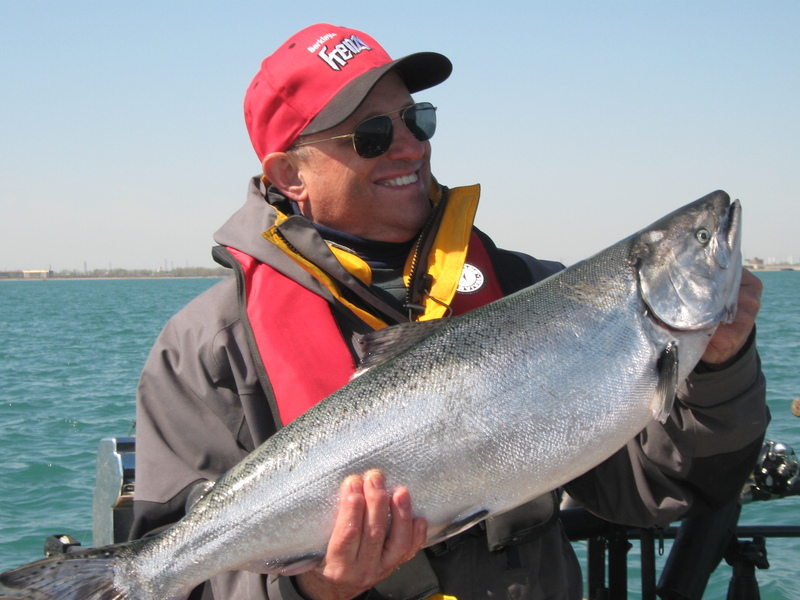 Hey, if you want to book a charter fishing trip, I’ll be glad to do that, as well. Law number one: Don’t fix it if it ain’t broke. What a great rule to live by. If the car was running when it the key was switched off yesterday, expect it to start up and run today. This is no time for Murphy's Law to apply. These two laws illustrate the yen and yang of using mechanical items. Machines, toys, engines and fishing tackle often seem to behave spitefully towards their user. Proper maintenance is a good way to stave off Murphey’s Law. A well maintained machine is less likely to “go wrong” than one long ignored. However, maintenance goes directly against the “Don’t fix it...” rule. A conundrum, to be sure. For years, when it came to my fishing reels, I (mostly) adhered to law number one. Other than reels affected by Murphy’s Law, I left them alone. More than just years, more like years and years and years for some of them. The reel was working when I retrieved the last lure yesterday. It will surely work tomorrow. Won’t it? Or will Murphy show up? So in my “off season” this year, I broke law number one. I collected all my most-used reels. I found long-filed-away schematics for each model or looked up the exploded views on-line. I purchased new drag washers for each reel, gathered reel grease, household oil an assemblage of small tools, degreasers and swabs. Then I “fixed” them. At least, I carefully disassembled each reel, cleaned all the inner workings, replaced the drag washers, then and greased, oiled and reassembled. It’s not rocket science though I do have a new respect for watch makers. What could go wrong? We’ll learn much of that answer in mid-March when the reels are put back into service, clean, shiny with no pressing need to be fixed for another decade or so. Unless Murphy decides to go fishing with me.